Did you miss a webinar or want to catch up on previous offerings? HQI updates past webinars on a monthly basis. This webinar will present the fifth quarterly release of the Quality Transparency Dashboard developed by the Hospital Quality Institute, through a partnering agreement between the Hospital Quality Institute, the California Hospital Association, and Patient Safety Movement Foundation. The Quality Transparency Dashboard supports and facilitates transparency on specific publicly available quality metrics. 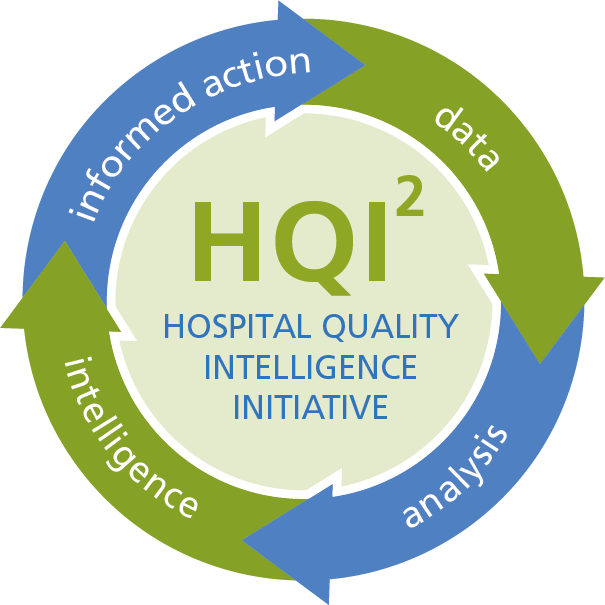 Attend a webinar to learn about the Hospital Quality Intelligence Initiative (HQI2). HQI2 brings together disparate data sources and integrates them a single statewide quality improvement platform to provide hospitals and health systems with access to reports and benchmarking tools that will fuel improvement using data that is timely, clinically relevant, standardized, and valuable in advancing care. Prediction of Cardiorespiratory Compromise on Hospital General Care Units: Are We There Yet? <p>Patients recovering from surgery on a hospital’s general care unit have core vital signs checked once every 4–6 hours, which leaves them unmonitored 96 percent of their total time spent on the general care floor. Vital signs deteriorate 6–12 hours before cardiac and respiratory arrests occur creating a ‘window of opportunity’ for early detection and intervention. This webinar will present the fourth quarterly release of the Quality Transparency Dashboard developed by the Hospital Quality Institute, through a partnering agreement between the Hospital Quality Institute, the California Hospital Association, and Patient Safety Movement Foundation. The Quality Transparency Dashboard supports and facilitates transparency on specific publicly available quality metrics. This webinar will present the third quarterly release of the Quality Transparency Dashboard developed by the Hospital Quality Institute, through a partnering agreement between the Hospital Quality Institute, the California Hospital Association, and Patient Safety Movement Foundation. The Quality Transparency Dashboard supports and facilitates transparency on specific publicly available quality metrics. Looking for effective ways to minimize noise, promote healing, and increase your HCAHPS scores on Quietness of Hospital Environment? This 2-webinar series is for you! This webinar presented the latest research and proven evidence-based best practices for mitigating noise in hospitals. This webinar will present the second quarterly release of the Quality Transparency Dashboard developed by the Hospital Quality Institute, through a partnering agreement between the Hospital Quality Institute, the California Hospital Association, and Patient Safety Movement Foundation. The Quality Transparency Dashboard supports and facilitates transparency on specific publicly available quality metrics. This webinar will present the second quarterly release of the Quality Transparency Dashboard developed by the Hospital Quality Institute, through a partnering agreement between the Hospital Quality Institute, the California Hospital Association, and Patient Safety Movement Foundation. The Quality Transparency Dashboard supports and facilitates transparency on specific publicly available quality metrics. 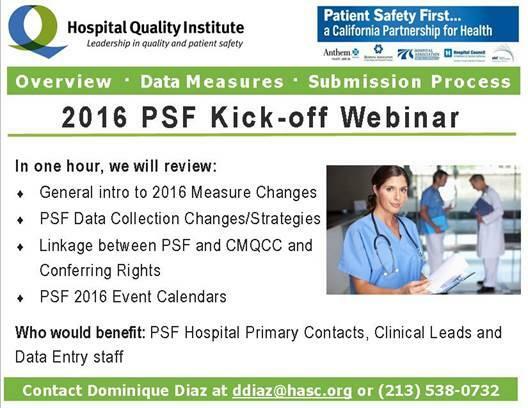 Following the webinar, HQI will email the hospital-specific Quality Transparency Dashboards to 355 California acute care CHA and regional association member hospitals. Achieving Reliability in Healthcare: What Does It Really Take? 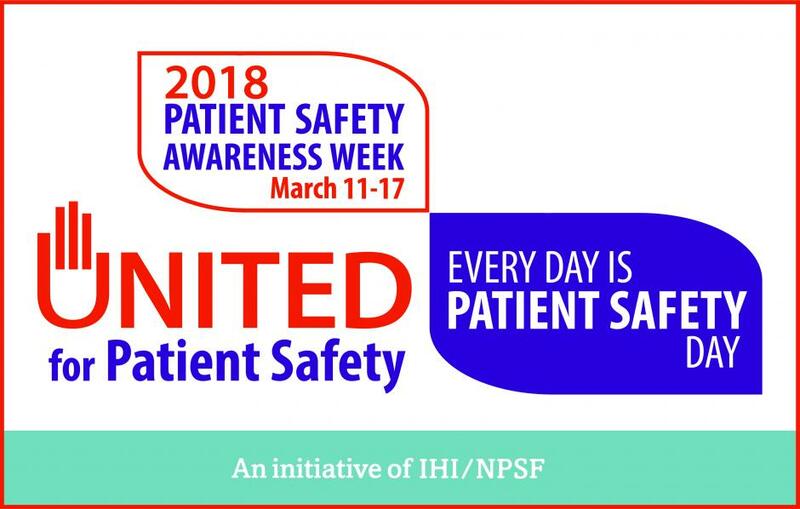 Healthcare quality professionals at Hospital Quality Institute (HQI) proudly join the Institute for Healthcare Improvement and the National Patient Safety Foundation, and those around the country in celebrating Patient Safety Awareness Week, March 12-16. The week brings greater recognition for the healthcare quality profession and the contributions and impact these professionals make in their organization for patient safety and patient experience. Join us at the lunch hour on Wednesday, May 18th for a webinar with national subject matter expert Dr. Kalvin Yu as he delves into Clostridium difficile pathophysiology, rates, and mitigation strategies, including information on antibiotic stewardship, environmental cleaning, contact isolation and hand hygiene, as well as the latest updates on high risk demographics. Our presenter, Martha Ackman defined reliability and resilience, as well has provided an update on CalHEN 2.0. California hospitals are invited to join the California Maternal Quality Care Collaborative (CMQCC) webinar on Supporting Vaginal Birth and Reducing Cesareans through Data-Driven Tools. The webinar will introduce California hospitals to the upcoming CMQCC toolkit, collaborative and data tools designed to support reductions in cesarean birth rates—all provided at no cost to California hospitals in 2016. Empathy, and its reliable expression in health care interactions, is a key driver of patient experience. Success is directly linked to HCAHPS scores on such domains as communication with doctors and nurses, responsiveness of hospital staff, pain management and recommendation of hospital. Empathy is a skill that can be enhanced and developed in individuals, and nurtured in organizations. 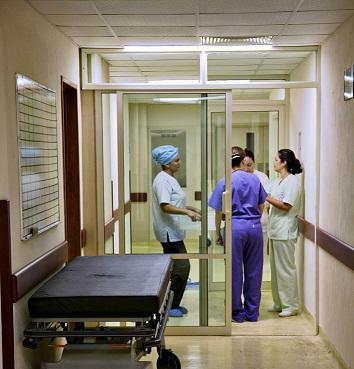 Is noise level in patient care areas one of the lower scoring HCAHPS domains for your hospital? Are you working on reducing noise as part of enhancing the healing environment? You are not alone! California hospitals have worked hard to address the issue of noise, yet the scores on the HCAHPS question “During this hospital stay, how often was the area around your room quiet at night” remain a full 10 percentage points lower in California than in the nation as a whole (51% vs. 61% top-box score). 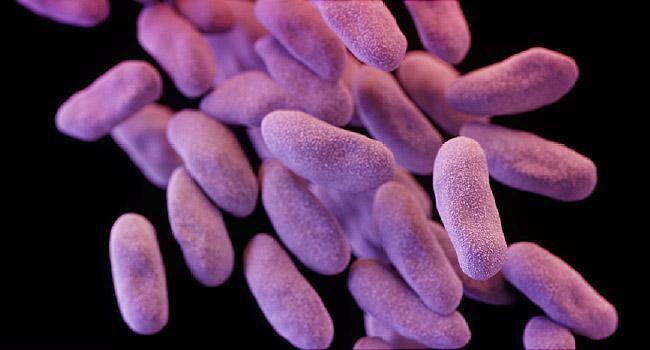 Today, the White House released a comprehensive plan that identifies critical actions to be taken by key Federal departments and agencies to combat the rise of antibiotic-resistant bacteria. VHATV produced a live webcast entitled, Understanding Populations to Improve Care and Reduce Readmissions on November 13, 2014. Panelists included Dr. Bruce Seigel of the EHEN, Dr. Knitasha Washington of the NCD and Dr. Paul McGann along with moderator, Dr. Robert Dean from VHA. The discussion focused on the use of data to support an enhanced understanding of the needs of the populations served. The impact of social determinants on health status was discussed through a video from Dr. Richard Lichtenstein of the University of Michigan. “Strategic communications” is a critical component to QI programs and initiatives. To be effective and sustainable, these programs requires institutional buy-in. Clinicians are often challenged to communicate the purpose and importance of the QI program to peers, as well as potential allies and detractors in other departments. Keeping any QI program effective requires institutional buy-in and culture change, and that is not possible without developing a compelling message and then delivering it effectively throughout the institution. Patient Family Engagement. What is it? Where do you get it? What does it look like? Where do I start? From the IOM to the Institute for Healthcare Improvement, CalHEN and hospital associations across the country are calling for Patient Family Engagement as a strategy for meeting quality, safety and patient experience goals. There is limited information on how to create this engagement at the hospital level. This webinar provides case studies of methods hospitals are using to engage patients and families in the clinical relationship. In addition, the value of creating pathways for patients and families to engage with the hospital leadership for improvement is highlighted. Current strategies for establishing partnerships were shared as well as some jumping off points, for organizations just starting on this journey to engagement. 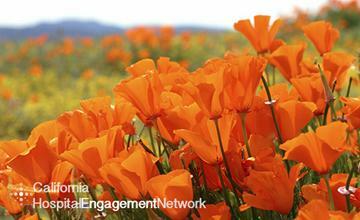 The California Hospital Engagement Network (CalHEN) will host a free webinar to highlight the accomplishments of HEN hospitals since the initiation of the HEN program in April 2012 and to introduce upcoming program activity. With the Partnership for Patients (PfP) program ending this year, we will present learning and sharing opportunities to help drive hospitals towards achieving the 40/20 PfP goals. This webinar reviewed focused, efficient approaches to reduce VAE, which included the Ventilator Associated Pneumonia (VAP) bundle and the ABCDE bundle. Participants will heard from national subject matter experts and peer leaders at AHA/HRET HEN hospitals. The presentation included references related to the VAE change package and top ten check list. This webinar focused on the “How to’s” of developing a Patient Advisory Council at your hospital. Lessons learned and critical elements of this program were discussed including: preparing and educating hospital staff; logistic, structure and role of an Advisory Council; and most importantly who to approach, screen and interview to represent the patient and family perspective. This webinar reviews the role that normal skin flora plays in the development of a surgical site infection and the goal of pre-operative skin cleansing. Benefits and risks associated with chlorhexidine gluconate (CHG) showers shall be discussed. Barriers and human factors challenges associated with surgical site infections shall be reviewed. Are you unsure how to approach adding a Patient Safety Advisor on your hospital Patient Safety Committee? Does the idea cause concern among clinical or administrative staff? Have you added this new advisor role and now have concerns or questions about gaining improved quality outcomes? This Patient/Family Engagement Webinar May Be For You! Learn how Sharp Grossmont Hospital is reducing Early Elective Deliveries (EED) using an interdisciplinary approach. Share in the data collection process, lessons learned and practical tips acquired along their successful journey. This webinar will outline the key components to developing an effective program to decrease the number of EEDs. CHPSO invited members and non-members to join Rory Jaffe, MD, MBA, Executive Director of CHPSO, as he helped demystify one of the Affordable Care Act’s (ACA’s) least-understood mandates during a free webinar. Controlling glycemic levels in a hospital setting can be challenging when considering all of the variations associated with insulin therapy and oral hypoglycemic agents. Learn how UCSF is redefining best practice in managing glycemic levels in hospitalized patients. This session is designed to introduce you to a community of learning to both analyze and shift fall prevention programs to protect patients from injury. An overview of the state of science in fall prevention and injury protection will set the stage for new tests of change for clinical practice, patient education, and environmental safety. Participants will learn about a population-based approach to protection from injurious falls, along with strategies to increase patient engagement and program evaluation. Recording of CalHEN presentation by Sharp Memorial Hospital on their fall prevention program with a focus on connecting the dots between assessment and intervention, sharing of the STOP fall prevention sign and the use of SMART goals to support staff engagement. Watch this recorded webinar presented by Verna Sitzer, MN, RN, CNS and Judd Feiler, MS, PT. Download the presentation slides to follow along with the recorded presentation.